I have very little money invested in either account, but this isn’t actually about money for those of you who are just skimming the article. Actively-traded brokerage account I opened with a small amount of savings as an experiment after realizing my bank was paying me 0.25% interest on that money, and after borrowing some concepts from Joel Greenblatt but only investing in companies with excellent analyst recommendations when they dipped below their normal range without substantial cause. (Axis is chopped to not show off my pitiful balance, but the rate of return is approximately 30%.) Overall: Great investment. 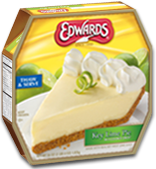 Key Lime Pie, frozen, bought at supermarket and stored in freezer for whenever I want a slice, even if it’s not a tenth as good as something you’d find in a gourmet restaurant or in Key West: Excellent investment. Like any good geek, I locked down my wireless network a bit after I set it up. I’m running WPA2, and the password/key was generated with pwqgen, for something sufficiently secure but semi-memorable. 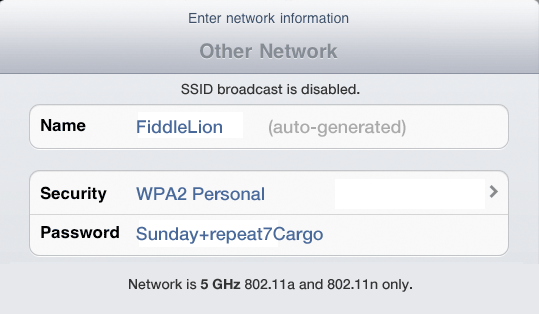 I disabled SSID broadcast. My router automatically generated a weird name, which I presume to be two random dictionary words mashed together. More for congestion-avoidance than security, I also run the router on 5 GHz instead of 2.4 GHz, which limits me to 802.11a and 802.11n. This seems to work with most everything (except for my HTC Inspire cell phone). My network isn’t any of the ones that pop up on your wireless device, because I turned SSID Broadcast off. You have to manually add it. It’s WPA2, not WEP. It’s also Personal, not Enterprise, so there’s no username prompt. The name is weird, because it was auto-generated. Stop asking what it means; it means nothing. It’s only on 5 GHz. My plan (once I get my printer set up and working) is to print a couple copies of this on thick cardstock like an index card and keep them handy for when guests want to use my network. Photoshop template here [720KB, .psd], if you’d like.